La Celestiere, is one of the younger and more exciting new producers in the Southern Rhone Valley. Previously, the estate bottled and sold their wines under the name of La Glaciere. The debut vintage for La Celestiere was the 2010. Owned by Noel Joyce and Beatrice Joyce, the couple got their start as winemakers at Chateau Dalmeran in Saint Etienne du Gres before moving to Chateauneuf du Pape. Once the Noel family purchased the property, extensive work was required to modernize La Celestiere in the vineyards and wine making facilities. Most of the buildings were in poor shape, so the project proved quite expensive. However, today, just a few short years after they purchased the estate, La Celestiere is now one of the more modern estates in Chateauneuf du Pape. La Celestiere has 10 hectares of vines in Chateauneuf du Pape. Many of their vines are close to 100 years of age having been planted between 1918 and 1920. All vineyard work is done using only biodynamic farming techniques. In fact, the property was certified as a biodynamic winery by the Agriculture Biologique. The first vintage for La Celestiere is the 2009. La Celestiere makes 3 red Chateauneuf du Pape wines and 1 Chateauneuf du Pape Blanc. La Celestiere Tradition – Produced from a blend of 60% old vine Grenache, 20% Mourvedre and 20% Cinsault. The terroir is rocks, sand and clay. The vines are planted in the la Croze, les Galimardes, and Valori lieux-dits. The wine is aged in a combination of traditional cement vats and foudres for 12 months before bottling. On average, the production is close to 900 cases per vintage. 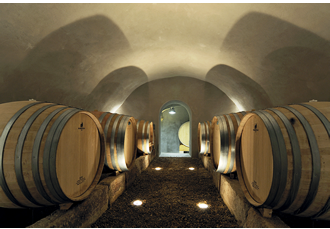 La Celestiere Cuvee La Croize – Made from 100% old vine Grenache, the wine is aged in cement vats. The average production is about 900 cases. La Celestiere Cuvee Les Domaines – Using 70% Grenache and 30% Mourvedre, the wine is aged in foudres. La Celestiere Chateauneuf du Pape Blanc is made from a blend of 47% Grenache Blanc, 47% Clairette and 6% Roussanne. Chateau La Celestiere can be enjoyed on the young side. Young vintages can be popped and poured, or decanted for about 1 hour. This allows the wine to soften and open its perfume. Older vintages might need very little decanting, just enough to remove the sediment. Chateau La Celestiere is usually better with 2-4 years of bottle age. Of course that can vary slightly, depending on the vintage. In the best vintages the wine should be consumed within 3-12 years after the vintage. Les Celestiere is best served at 15.5 degrees Celsius, 60 degrees Fahrenheit. The cool, almost cellar temperature gives the wine more freshness and lift. La Celestiere is best served with all types of classic meat dishes, veal, pork, beef, lamb, duck, game, roast chicken, roasted, braised, stewed dishes, sausage, barbecue, cassoulet and cheese. La Celestiere is also good with Asian dishes, hearty fish courses like tuna, mushrooms and pasta. The white wine of La Celestiere is best served with a myriad of different seafood dishes, shellfish, crab, lobster, sushi, sashimi, chicken, pork and veal, as well as Asian cuisine. The family also owns 3 hectares of vines in the Cotes du Rhone appellation and 6 hectares of vines classified as Vin de Pays. Medium bodied, forward, light and focused on its pleasant, but simple red berry character. Drink this young for its easy going energy. The wine was made from blending 55% Grenache, 15% Syrah, 15% Cinsault and 15% Mourvedre. Light in color, medium bodied, with a forward, peppery, olive tinged, kirsch character for delicious, elegant, early drinking. Light, dusty and lacking concentration, this red berry centered wine will be best on the young side. Polished and peppery, the fruit is deep, sweet, ripe, spicy and rich. The wine was produced from a blend of 70% Grenache and 30% Mourvedre. Fresh and fleshy, with a sweetness to the dark, peppery red fruits, the wine lingers and refreshes. Made from 100% old vine Grenache, the wine reached 15% alcohol. Lush and lusty, sweet dark red fruits and spice are all over the place. From a blend of Blending 55% Grenache, 15% Syrah, 15% Mourvedre and 15% Cinsault. From 100% Grenache, the wine is packed with silky, polished, juicy plums and cherry notes with a fresh, peppery, sweet, red fruit finish. The wine reached 15% alcohol. Elegant and forward, the wine serves up soft, sweet, cherries and spice in the medium bodied finish. Produced from a blend of 70% Grenache, and 30% Mourvedre, the wine reached 14.5% alcohol. Give it a few years to soften. Polished, fresh and pure, the elegant, silky, cherry dominated wine was produced from 100% Grenache. Red berries, earth and herbs, medium bodied with a light cherry note in the finish. Still in barrel in May, 2013, the wine should be in bottle by the summer of 2013. Inky in color, with an intensity of raw material to match, the wine is intense, concentrated and powerful. Everything is in balance. This finish seems to go on and on. With all this going on, the wine remains fresh, clean and pure. Delivering a rich, ripe, juicy mouthful of concentrated sweet, fresh, black raspberry jam, kirsch, black cherrry, pepper and garrigue. The wine is lush, long, lusty and sells for a fair price. Silky, smooth, soft textures, fresh strawberry, kirsch and garrigue on the nose, and a supple, red fruit finish that is already showing its stuff.